Novel imaging technologies permit us to detect prostate cancer (PCa) metastases at an oligometastatic stage. Metastasis-directed therapy (MTD) is already common practice in different fields of oncology. However, there are limited data available on the role of surgical MDT in non-nodal oligometastatic PCa recurrence. We aim to present the outcomes of a 2-centre series of patients who underwent surgical MDT for oligometastatic PCa recurrence in the viscera and bone. Between 1988 and 2016, 21 patients who experienced non-nodal oligometastatic PCa recurrence underwent surgical MDT (surgical excision at first or second relapse) in two university hospitals. Oligometastatic disease was defined as <4 lesions and only patients with non-nodal disease were included. Metastatic recurrence was detected with the optimal imaging technique available at the time of PSA recurrence. 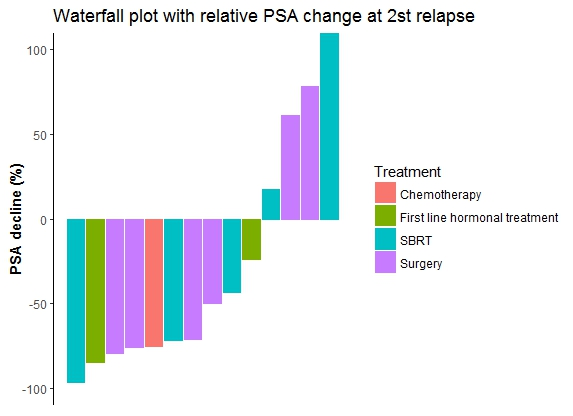 PSA value before and after treatment, the time to next relapse and the type of relapse (oligometastatic vs polimetastatic) were used as indicator of successful treatment. Clavien-Dindo classification was used to assess the surgical complication. The survival curve was calculated with Kaplan-Mayer curve. Eighteen non-castration-resistant PCa patients who experienced skeletal/visceral metastases underwent metastasectomy as first therapeutic approach, three underwent SBRT as first relapse, and surgical MDT at second relapse. Metastatic recurrence was detected with the optimal imaging technique available at the time of PSA recurrence defining oligometastatic as a number of lesion between 1-3. 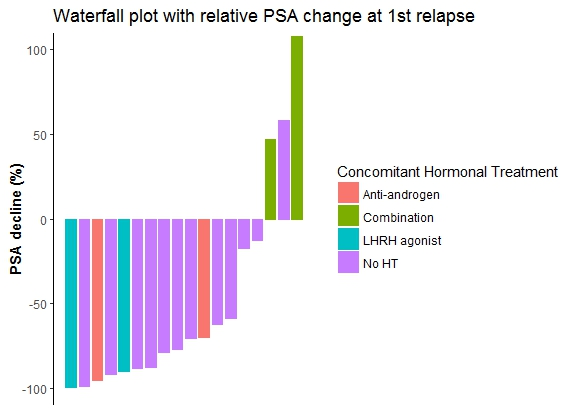 Twelve (66,7%) patients were no hormone-treated at the moment of MDT. 83% had visceral lesions and the other 4 patients respectively abdominal wall and bone metastasis. All subjects had histological confirmation of PCa after metastasectomy. 9 (50%) of the 12 patients who were not treated with ADT/antiandrogens at the moment of MDT, had a PSA decrease ≥ 50%. Median follow-up from primary treatment was of 131 months. After the first surgical MDT, 17 (94,4%) patients relapsed of whom 11 (61,1%) relapsed had oligometastatic disease. More than 40% of recurrent cases remained free from metastases for more than 1 year demonstrating possible long term complete response. We observed 8% (2) Clavien-Dindo grade major of 3-4 of the total of the surgical MDT. After a median follow up of 41 months from the first relapse, 3 patients died for PCa progression (14,3%), 13 (61,8%) were still alive and 2 (9,5%) were lost to follow up. The 4 years overall survival was 61% and median OS was not reached (95% CI 43 months-NR). This is the largest case series of surgical MDT applied to oligometastatic PCa recurrence in viscera and bone. The majority of patients had a PSA decrease and a complete PSA response was seen in almost more than 20%. Although roughly 3/4 of patients relapsed clinically, more than half of the cases remained free from metastases for more than 1 year with long-term metastasis-free survival in more than one third. Most of the metastatic recurrence was again oligometastatic and amenable to second MDT. These results form the basis to prospectively test surgical MDT in selected patients with oligometastatic PCa in a formal RCT.